Despite the Rada, almost 4 months ago, voting to lift MPs and judges immunity by a constitutional majority, that immunity (and impunity) currently remains in force. As such, should the Prosecutor General want to turn the wheels of the justice system in a meaningful way against any MP or Judge, the Rada must first vote to remove any individual’s immunity. Thus far a few requests have been made and granted – though for the most part not against any “big names” or persons of notable influence past or present. However, the Prosecutor General has now requested the Rada revoke the immunity of Sergei Klyuev, a man who is both a “big name” and person of notable influence in the recent past (and to a lesser degree today). Indeed to get a brief outline of Mr Klyuev’s formerly extensive influence, and thus current importance relating to alleged nefarious dealings, then click here for the tip of the iceberg. Needless to say, prima facie based upon the contents of the above link (and numerous others links similar to it) detailing the supposed dastardly activities of Mr Klyuev, the Prosecutor General has reasonable grounds to want to bring matters to court. Undoubtedly there will be evidence that is not in the public domain too. Thus on Tuesday 2 June at 0900 hours, there is supposed to be a Rada vote taking place whereupon the issue of Sergei Klyuev’s immunity will be addressed. However, the Rada committee that sits, discusses and makes subsequent recommendations upon such matters, are not in agreement as to recommending the removal of his immunity. Thus whether there will be a vote, and what recommendations will be made and followed (or not), remains entirely open to question. The question before the Rada committee, and indeed the Rada if an when a vote to strip immunity comes, is not one of presumed guilt or innocence – or at least it shouldn’t be, and neither should any such committee feel that it sits in judgement. Rada MPs are not learned judges sitting upon the bench to decide guilt or innocence. It is not form them to interpret evidence and arrive at verdicts. If the bar to the stripping of immunity was so high that it inferred the Rada committee, and the Rada, believed an MP was guilty, then any subsequent court case would be prejudiced by its actions. In fact many Rada MPs aren’t capable of crafting decent legislation from which the judiciary to subsequently deliberate and dispense verdicts, let alone sit in judgement. At the stage of requesting the removal of immunity from either Judge or MP, neither is there a case for the Rada committee, or the Rada, to closely scrutinise how evidence was gathered, any chain of evidence or breaks therein. That too falls to the courts, prosecution and defence to argue about. The question to hand for the Rada committee, and the Rada, whilst immunity for any individual remains, should be one relating to the gravity of the alleged offences, thus determining whether any individual should have their immunity removed in order to allow a proper investigation and subsequent court case. In the case of Sergei Klyuev, prima facie, it would appear to be very much in the public interest to allow the Prosecutor General’s application and put numerous matters before the courts where his guilt or innocence can be duly considered and verdicts delivered. What is therefore required in this particular instance is nothing more than the political will to put the first “big name” serving MP into the criminal proceedings machinery. Currently it is very much unclear whether that political will exists. Why? Because who would be next? Even bigger names? Liovochkin for example? Lesser names by the score? But did not the MPs vote overwhelming to remove this very immunity (even though it has not been removed) only 4 months ago? If Sergei Klyuev’s immunity is not removed considering the seriousness of the alleged crimes due to the lack of political will, then surely there is also cause to doubt that the will to complete the process to remove Rada and judicial immunity en masse remains. It will be both interesting to see, firstly whether the Tuesday vote will go ahead, secondly what the recommendations of the committee are, and lastly whether the Rada will actually show the political will to do what is clearly in the public interest – if not in the interests of some of its own members. Thereafter it is a matter for the courts. The last entry published concluded with these thoughts: “Some may now wonder over the fate of Regional Governor Igor Palitsa after such a shambles – (if indeed you consider him culpable and not the Chairman of the Oblast Council), particularly so as he is a “Kolomoisky man”, rather than a “President’s man”. The truth is, however, that his fate is already sealed despite having done a fairly reasonable job – certainly far better than his last two predecessors, and in far more challenging times. A matter of hours after publishing, it became clear that former Georgian President Mikheil Saakashvili was to become the next governor of Odessa Oblast. After many months of trying to find a suitable role for Mr Saakashvilli, President Poroshenko eventually found one. Perhaps the writing was on the wall when Mr Saakashvilli was walking the city centre streets of Odessa last Saturday – Day of Vyshyvanka (Ukrainian shirt day). That he wasn’t lynched possibly a positive sign. Undoubtedly this appointment will bring with it very mixed opinion both within and without Odessa – predominantly based upon personal likes or dislikes about Mr Saakishvilli and his history/legacy in Georgia. However, like or dislike the man, what matters for both Odessa and Ukraine, is the results he is expected to bring regarding reform. As such, when the dust settles, what will matter most is whether Odessa works with him or against him. One has to suspect, when that dust does settle, that it will work with him. He (and whatever team he appoints around him) will have several difficult battles ahead – the most obvious being with the notoriously corrupt customs at Yushni, Illichovsk and Odessa ports. By extension, that will also bring him head to head with organised crime and the Odessa mafia, as well as some other nefarious vested interests within the ports – such as the current Mayor. There is also the small matter of Odessa traditionally being the unofficial supply route to Transnistria. The second, in replacing Igor Kolomoisky’s man, Igor Palitsa (who generally didn’t do a bad job, but simply wasn’t the “President’s man”), he will still be faced by a very active Igor Kolomoisky defending his interests in Odessa. Mr Kolomoisky has control over a quite large minority within the deputies of the Odessa Regional Oblast – enough to make the 67 votes required to pass any motion somewhat difficult when added to a few dissenters, or those deputies under the influence of Rada MPs Cisse, Gyliev and Pressman who are not “Poroshenko friendly”. The potential confrontation with Messrs Cisse, Gyliev and Pressman provides a possibility of division rather than unification, particularly in the south of the Oblast where they have their power base – places where thus far fantasy organisations such as “The People’s Council of Bessarabia” have targeted. There are then also people such as Sergey Kivalov to deal with. The third, is the expectations of those that will desire swift reform, and the prompt arrival of rule of law. There will be those that will expect swift action against well known corrupt but current public servants and notorious businessmen. Will he take on City Hall and the snake-pit within as created by the current Mayor? Whilst there are fairly frequent visits by the international diplomatic corps to Odessa, those are likely to increase – after all, how many provinces have an ex-President as a governor? (As a result, I will perhaps eat out for free more often too, as your author is generally given audience when such enlightened people visit Odessa). Mr Saakashvilli need take great care not to up-stage those in Kyiv. Undoubtedly Odessa can expect Mr Saakashvilli’s best efforts to “hammer” reform into the Oblast, albeit his political energy being politely phrased as “a locomotive and standard setter for regional reform” – or similarly worded. Equally, Odessa will become an Oblast that all other Oblasts will watch with either expectation or trepidation. Nobody will be surprised to see many sudden changes in the regional institutional leadership either – particularly as “lustration” in Odessa was very much a non-event. On a more positive note, Odessa has been extremely lackluster in chasing down things like EU grants, adopting meaningful international relationships, promoting itself, and attracting FDI. That, one has to suspect, is likely to change both by design and by default. Thus, whilst the presidential political priority was to replace a “Kolomoisky man” with a “President’s man”, when the dust settles following this appointment – and it is important to let the dust settle – time will tell whether what is a politically risky, and perhaps even divisive appointment, may actually work – or the certain ire it will cause within the Kremlin may rear its head in a very nasty way indeed here. For sure, whatever the outcome, this blog will not be struggling for content! Yesterday saw the Odessa Regional Administration assembly fail to vote in favour of the Odessa Oblast plan to adhere Government of Ukraine’s “voluntary association of communities”. Indeed the Cabinet of Ministers insists upon the creation of this “voluntary association of communities”, under the pretext of its necessity when allocating funding for the newly created, united administrative units – Somewhere in that, perhaps there is some logic? Clearly allocating funds to the old administrative units is somehow now impossible, and thus there is an insistence that new “voluntary administrative units” be created, that can then subsequently be funded. 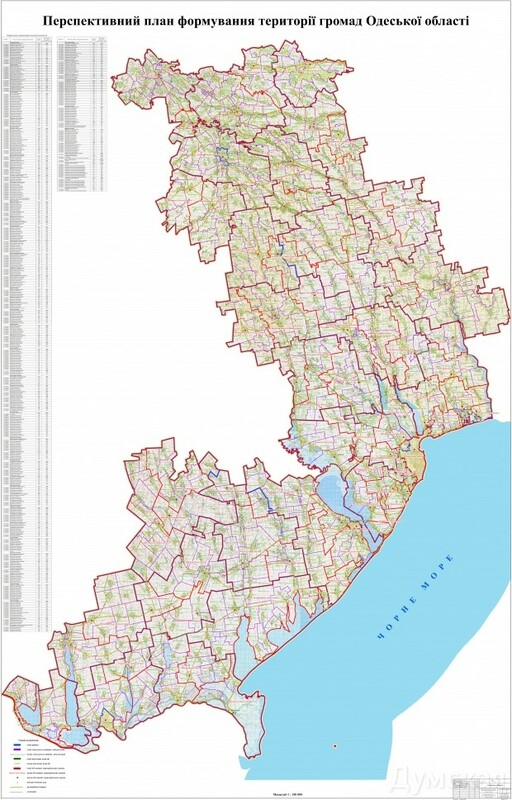 Currently, the proposed new administrative units of the Odessa Oblast would look something like that displayed below – if they can garner 67 votes in favour within the Oblast chamber. The above map of newly proposed administrative units failed to gather the requisite number of votes to become reality however. 25 votes in favour, 60 against. A resolute rejection. The new administrative unit plan was rightly and properly rejected for several reasons – some with far more validity than others for procedural reasons, matters of democracy, and others for entirely political reasons that may or may not hold validity depending upon your point of view. Firstly, there was little, bordering upon no transparency in the process of how the newly proposed administrative units were formed. There was little, if any, public input, and very little consultation with the elected Oblast deputies or the village councils. Undoubtedly problematic for a voluntary local association (albeit one that is insisted upon), democratically questionable unless you consider it a purely administrative process, but nevertheless procedurally flawed if you do. Secondly, what had been provisionally circulated to a select few, was not what was presented yesterday. Indeed, as late as 1900 hours the evening before the proposal was put to the vote, changes were still being made to boundaries. By way of a few examples, at 1800 hours two nights ago, the plan was to join together Odessa and the surrounding suburbs and villages of Tairova, Mizikevicha Hutra, Balky, Liman, Fontanka Kryzhanovka and Leski. By 1930 hours that idea had been scrapped and Odessa was to join solely with Usatove. Similarly, Illichovsk which had previously been tied to Gribovka and Sanzheyka, suddenly lost them, remaining with only Burlacha Balka, Oleksandrivka Malodolinskim and Molodejni. A last minute change to what would have been a very large district combining Ananiev, Krasni and Kodyma, saw it split into two. The Tatarbunar region that was planned to be two districts with administrative centres to be Tuzla and Tatarbunary suddenly became one – to the ire of Tuzlovskogo that has long prided itself of being distinct. Thirdly, a resolute rallying against the plan came from the south of the Oblast. This primarily led by Rada MP Anton Cisse, supported by fellow Rada MPs Messrs Gyliev and Pressman. Understandably so when considering for example, Anton Cisse’s robust core voter base is the ethnic Bulgarian electorate which currently resides in a single administrative unit in the south of the Oblast, but which under the plan would split. Mr Cisse is far too busy with his business interests for the Rada on occasion, let alone having to deal with two (or more) newly minted administrative units instead of one. His costs would increase and, perhaps, his influence decrease. Thus the “ethnic card” was also played regarding boundaries. Though the combined political weight of MPs Cisse, Gyliev and Pressman via their allied/owned Oblast deputies may just have been enough to stymie the submitted plan alone, it was clearly not necessary with so many others more than dissatisfied with the processes, lack of public engagement, last minute changes and general lack of transparency. Nevertheless, all 3 Rada MPs made it very clear that their combined position was one that approving the project yesterday would be “premature” – a position shared by most of the Oblast deputies for one reason or another listed above. Though it is often difficult to agree with Messrs Cisse, Gyliev and Pressman on many policy issues, and whilst no doubt their objections were driven by personal interests, many objections are nonetheless valid whether weighed on the scales of democracy, or upon the balance of procedural adherence. The regional “voluntary association plan” was thus thrown out, albeit not out of hand, but after a 3 hour debate within the Oblast chambers. Boundaries will surely have to be changed again to get anywhere near the required 67 votes to adopt any “voluntary association plan”, hopefully this time with transparency as the undercurrent of the exercise. Some may now wonder over the fate of Regional Governor Igor Palitsa after such a shambles – (if indeed you consider him culpable and not the Chairman of the Oblast Council), particularly so as he is a “Kolomoisky man”, rather than a “President’s man”. The truth is, however, that his fate is already sealed despite having done a fairly reasonable job – certainly far better than his last two predecessors, and in far more challenging times. That he is still in post is simply down to the fact that the President has run out of close and trusted friends/acquaintances and ex-Vinnytsia chums to fill the Odessa Oblast (or any other) Governor’s post. Nobody within the Odessa Oblast Administration has any idea who will eventually replace Igor Palitsa. Thus Mr Palitsa remains in situ, for he is at the very least a dependable patriot of Ukraine from President Poroshenko’s point of view, even if not a “President’s man”. However, whatever Mr Palitsa does, his days are numbered -and those days are synchronized to the ability of the President to find “his man” that is both willing, capable, and trusted, to run Odessa Oblast – notwithstanding likely to be accepted by the constituents. If the presentation of this administrative plan in the manner it occurred was an exercise in failing to build political consensus, lack of transparency, democratic failure and administrative fumbling, then it was successful. On a positive note, it appears that gone are the days when important proposals are simply railroaded and/or rubber-stamped in the Regional Oblast Administration regardless of procedural flaws or political expediency. Yesterday saw the Prosecutor General of Ukraine declared that former (and much loathed) Education Minister Dmitry Tabachnik was wanted on suspicion of committing offences under Part 5, Article 191, of the Criminal Code. No surprise to anybody that followed his actions and tenure in office. For those with a little more insight, it is known he was under investigation for a good many months for several crimes, including a pricing scam over Ukrainian school books and nefarious dealings with educational premises during his tenure – A point made in this entry of 1st March, when Mr Tabachnik flew into Kyiv from Tel Aviv for 24 hours. Indeed the entry raised a few entirely reasonable questions about his appearance in Ukraine, as it is clear an individual with such notoriety/infamy could not simply “sneak” into Ukraine unnoticed. The Ukrainian authorities will have known of his intended arrival if this blog knew of it and published an entry about it. Mr Tabachnik remained in Kyiv for less than 24 hours, returning to Israel. Whether he traveled to Ukraine on an Israeli or Ukrainian passport was irrelevant once upon Ukrainian soil. Whether he is in Israel as a Ukrainian or Israeli citizen is now relevant however, considering the Israeli policy of extradition relating to its citizens can be far more miss than hit. “Do not deliver to his master a slave who has escaped from his master. He shall dwell in your midst with you, in the place he shall choose in one of your gates, where it is good for him; you shall not oppress him.” – Torah. Torah aside, if Mr Tabachnik is still in Israel and has been granted Israeli citizenship, any extradition request is going to struggle – Israel really doesn’t extradite its citizens very often. Therefore, as it is extremely unlikely that his return to Ukraine a few months ago (even if for a few hours) occurred without the consent/knowledge of Kyiv, and knowing that he was under investigation for various nefarious acts at the time of his visit, a few questions require asking. The first, why was he not detained when in Kyiv and investigations into his nefarious activities were on-going? Lack of sufficient evidence at the time perhaps? The second, if investigations were on-going but were not sufficiently advanced to pursue the officially, why allow/facilitate Mr Tabachnik’s entry before the authorities were ready? The third, as it is likely that Mr Tabachnik knew the authorities weren’t ready (for Gov UA remains an infiltrated and leaky ship), and the Ukrainian authorities knew they weren’t ready, perhaps a grubby little deal to gain testimony in return for some time to complete personal administrative tasks in Kyiv prior to retuning to Israel was made – on the understanding that once investigations had progressed sufficiently to deal with his previous nefarious acts, he would be safely entrenched in Israel with no need to return to Ukraine again, and with little chance of extradition. Gov UA and the PGO, however, are seen to be trying to deal with the past regime of which he was a part. The answer to this may become clearer if any public trial of former senior regime members occurs and from out of nowhere, any signed testimony from Mr Tabachnik, dated 28 February/1 March 2015 is used. Whether any public trial of any senior former regime members ever comes to pass, let alone in which any possibly obtained Tabachnik testimony would be relevant, is perhaps a different question. Fourth – Are the Ukrainian authorities really so incompetent as to allow Mr Tabachnik in and out of the country, only to then, two months later, declare him as wanted? A question of stables, doors, and intent to close then in a timely fashion? The current tenure of the Supreme Council of Justice in Ukraine is about to end. It is a body, that amongst other things, advises upon the appointments, and release of judges within the “high specialised courts”, – such as the Supreme Court of Ukraine – and is also responsible for disciplining such highly placed “learned judiciary”. It comprises of 20 members, split equally with half dealing with the appointment/release of judges, and half dealing with disciplinary issues. Three of these members are the simultaneous occupants of other appointments and take their positions by virtue of holding these other roles. Those roles being the Chairman of the Supreme Court, The Prosecutor General and the Justice Minister. The remainder hold office for a 6 year period, with 3 appointed by the President, 3 by the Rada, 3 by The Congress of Judges, 3 by The Congress of Advocates, 3 by The Congress of Law Schools and Scientific Institutions, and 2 by the Conference of Prosecutors Employees. It is those 17 whose tenure expires in the immediate future. A new Supreme Council of Justice is expected to be nominated and sworn in during June. However, The Judicial Reform Council, tasked with the job of sorting out the judiciary and turning it into a judicial system fit to grace even the most consolidated of democratic and politics-free legal machinery in any European State, is still working on amendments to the judicial system and indeed to the system of appointing the Supreme Council of Justice, together with significant reform of its competencies with regard to appointment/release issues and disciplinary matters. It appears to be a root and branch reform too – the High Qualification Commission of Judges also looks to be getting a major shake-up. All such reform, hopefully heavily biased toward genuine judicial independence. Indeed many draft amendments to existing legislation that would provide for the reforms identified and proposed by The Judicial Reform Council have been written – they just haven’t been submitted to the Rada, as many, if and when adopted, would also require the Constitution of Ukraine to be amended too. Thus a repeat of the law removing MP/Judicial immunity would occur. It was passed in the Rada, tossed to the Constitutional Court for its deliberation, tossed back to the Rada (where MPs immunity now sits gathering dust- again), before eventually going to the President for signature and publication – at which point any new/amended law and constitutional amendment enters into force. As such MPs and judges still retain their immunity – 4 months after MPs voted to remove it. Needless to say, any identified and recommended procedural appointment changes, and role expanding legislation, is not going to be in place before the next 6 year Supreme Council of Judges take up their positions. They will undoubtedly assume office under the old – and seemingly unsuitable – legislation and appointment procedures. With the tenure date of the Supreme Council of Justice known long in advance – indeed from the date of their appointment almost exactly 6 years ago – one perhaps will wonder why legislative amendments have not already been submitted, and the party whips not garnered a constitution-changing 300 MPs to vote the new legislative amendments through – thus having already thrown the matter to the Constitutional Court, awaiting its return in a timely fashion before expiry of the current, sitting Supreme Council of Justice. As a result, in the absence of an emergency decree extending the current Supreme Council of Justice tenure for “x” months whilst laws are passed and bureaucratic niceties/requirements rightly followed, judicial reform, certainly with regard to the next Supreme Council of Justice, will begin to take effect regarding its composition and the process thereof, 6 years from now. It’s going to take a very long time to reform the judicial system and the judiciary, if definitive tenure time lines are going to be missed (deliberately/negligently) by a few months, insuring the old system continues for another legislatively fixed tenure. Many nations have domestic nuclear/atomic companies. Generally they are carefully watched over, and are open to, International Atomic Energy Agency (IAEA) inspection, oversight and regulation – not withstanding domestic regulation, “watchdogs”, and oversight. Many, however, are independent actors from “the State”, rather than a direct extension of “the State”. By “direct extension”, think Kremlin and Gazprom, a company whose actions are simply dictated by The Kremlin for political purposes, regardless of its profit and loss or balance sheet. So too, as is the way in Russia, is Rosatom. Today saw the release of the 2015 edition of the IAEA “Nuclear Power Reactors in the World“. Ergo, as with Gazprom, any Rosatom “power projection” and by default critical dependence thereon for fuel, maintenance etc, warrants a closer look – for therein, given The Kremlin penchant for using energy dependency as a lever within its foreign policy toolkit, a careful eye should, perhaps, be cast over its activities, both on-going and planned. This is particularly so, perhaps not only in Europe as another lever within certain nations, but also where The Kremlin now sees its Holy Grail – a world changing grand alliance with China and India in the decades ahead (no matter how realistic or otherwise, any such grand alliance actually is). After all, Kremlin desire to return to “Great Power”status whilst being a shadow of the USSR, will be accomplished only by piggybacking upon two up and coming major powers. As they don’t need The Kremlin to continue their ascent, dependencies must therefore be carefully inserted whenever the opportunity arises. The first of many “wrongful dismissal” verdicts? The following is not a case of “lustration” per se, but nonetheless similar in nature, outcome and quite probably subsequent recourse for many “lustrated” that (whilst quite possibly guilty) where not dealt with correctly nor investigated properly. This is the summarised case of Interior Ministry, Odessa District Investigator Vitaly Sofiyanik, sacked by the Ministry of Internal Affairs (not prosecuted in any way) for “separatism”. The evidence employed to justify his sacking, a VKontakte social media account under the name Vitaly S, which displayed an avtar of the St George ribbon, a symbol that since last year has sadly become as associated with “separatists (and Kremlin fighters)” as it has with war veterans and those that sacrificed themselves in the fight against Nazi Germany. The St George ribbon avtar was annotated with the word “Riot”. The Vitaly S VKontakte account was also a member of the social groups “Odessa People’s Republic”, “South East Federation” and “Antimaidan”, all of which were anti-Kyiv and/or pro-Kremlin. All ultimately failed in Odessa due to a severe lack of public interest in their cause(s). There were also cartoon entries mocking the MIA and a displaying photographs of Sevastopol “2014, Russia”. The 2007 VKontakte account of “Vitaly S” was exposed as indeed being a VKontakte account of Vitaly Sofiyanik, MIA District Investigator, by local journalist Dmitriy Bakaev, on “Circle TV”, a local television station in Odessa. So far, so circumstantially condemning – thus the sacking of District Investigator Sofiyanik, by the MIA swiftly followed – creating a vacancy, subsequently filled, at his Suvorov station. Mr Sofiyanik then appealed to the Odessa courts for wrongful dismissal – claiming in court that as a District Investigator, he had used the VKontakte account to infiltrate the separatist groups in an attempt to obtain intelligence and evidence. If that be true, then he was certainly not alone in pursuing that line – the SBU, militsia, intelligence personnel attached to embassies and consuls were all trawling the social networks for “persons of interest” and any apparent signs of an “up-lift” in “separatist” sympathies. No doubt amongst all that trawling a few other SBU and militia run VKontakte accounts also joined these aforementioned social groups for exactly the same intelligence gathering reasons. Infiltration, infiltration, infiltration (though hopefully not agent provocateur). Indeed, there are several marketing companies in Odessa that run a stable of fictitious VKontakte accounts across all demographic lines, carefully building each profile a history/legend and joining certain social groups. These marketing companies then subtly employ these profiles to promote this or that – often having approving conversations over a product amongst the fake profiles for others to read and “take the bait”. The learned Judge may indeed be quite correct. What chances of a genuine and thorough internal investigation/discipline hearing within a still very politicised MIA – particularly to is those early, most volatile of days. Questions therefore arise over the breadth of “discretion”, and the “depth” of confidentiality within which District Investigators work as individuals, and, of course, any oversight and supervision that District Investigators may or may not have, in what remain highly corrupt and Kremlin infiltrated institutional systems. Perhaps others were aware of Mr Sofiyanik’s well-meaning actions but, as with the poorly crafted “Lustration Law”, when matters were exposed and likely to cause (perhaps violent) public disquiet, the man was sacrificed for the sake of “peace and stability”. Something had to be seen to be done – and swiftly. Maybe, in the still unreformed Odessa Courts, this verdict was simply “bought”. Then again, as the MIA can appeal the decision, perhaps such a practice would be deemed too risky – for surely “lustration” will eventually reach the Odessa judiciary in a far more meaningful way than that which has so far taken place. A decision reached purely upon the evidence (or lack thereof)? If the MIA do appeal and win, then it’s off to the ECfHR the case will go, adding yet another case originating from Ukraine to an already disproportionately high number – and as stated in the entry linked within the very first line of these ruminations, it will find company amongst numerous procedurally flawed/evidence lacking “lustrations” that will also head to Strasbourg. If the MIA doesn’t appeal, then either justice for Mr Sofiyanik has been done, or there is a cancerous cell returning to a still infected/infiltrated institution. It is not a question of whom to believe, it is a question of the burden of proof and reasonable doubt, ladies and gentlemen of the jury. You are currently browsing the Odessablog's Blog blog archives for May, 2015.